Back from Moosonee. 1 life bird, 9ish new year birds and lots of cool adventures. Jenn and I had a great time! I've decided to post-date our bird sightings on the blog over the next 4-5 days, just to give me some material while I'm working! (Yes, working on the weekend, but I did have 3 Golden Eagles, Snow Goose, Cackling Geese etc etc at work today). Jenn drove my tired backside to North Bay in the dark (I was sleeping in the passenger seat), in hopes of giving us lots of daylight to explore our way to Cochrane. The first train wasn't until the 25th (Monday, 9am)! Lots of time for fun. I forgot to bring my notes for this day with me, but in short, we had lots of fun exploring some cool parks, a 100m fire tower and a few nice towns. Cobalt was a fun town to drive through, and a flock of Waxwings was probably my bird-highlight of the drive. I was excited to see them, and told Jenn we should chase them down in case there was a Bohemian or two mixed in... We found them in a nearby tree, and were delighted to see that the whole flock of 75 birds was Bohemian Waxwings! No other noteworthy sightings on the drive. Lake Temiskaming was dead! Train rolled out of the station at 9am. We saw some finches etc. in the early going, but it wasn't for a few hours before anything really started to show itself. Jenn spotted an odd looking Grouse-sp. that was flushed by the Train - so we started keeping a keen watch out the window. After a few more "Grouse sp" sightings, we had good looks at a flock of Sharp-tailed Grouse flying away down a clearing!!! Actually a life bird for me. The next big excitement came in the form of a Northern Hawk Owl perched on a hydro pole. We had a second NHOW 30 mins later. Pretty enjoyable looks considering the fact we were on a train. Not much else on the old train. 1 Rough-legged and 2 Red-tailed Hawks. Lots of Snow Buntings, other grouse. We arrived in Moosonee around 2:30 and had some time to look around! The G Black-backed Gull was distant on the sandbar. The odd Mourning Dove was only a few feet away from us, walking down the road. Sure hope the crazy bird decides to fly south before the real cold weather arrives. Spent the night in a hotel room, getting ready for our next days adventure! Which will also be the topic of the next blog post (Oct 26th, Ship Sands Island)! Bird photos will be somewhat lacking in future reports, but I'll make up for it! Jenn and I are on the road in a few hours. There will be no new entries while we are gone! Boreal Chickadees are clearly on the go. A check of the Birds of Hamilton showed that past large-invasions had a strange pattern. --- and then some of the highest counts (peak of the push) occurred in late October!!!! If you want Boreal Chickadee,, the next 2 weeks are PRIME TIME to look! Crazy Moosonee bird reports when we get back!!! (Train late Friday) Thanks for the postings on the last blog entry!! I always enjoy the comments, just short on time right now to do much more than this post! Jenn and I are heading to Moosonee/Moose Factory next week. Weather looks prefect for some songbird vagrants. I won't be posting to the blog while we are away, but daily postings should return around Oct 30/31st - including recaps of the trip! It's painfully obvious this is a great time to be looking for Gray Jay, Boreal Chickadee, Black-backed Woodpecker, Evening Grosbeak, Red Crossbill etc. in southern Ontario. Is a very successful breeding season the cause? I didn't see any during the last week, but BC Chickadees and Hairy Woodpeckers were obviously on the move. It looks like it's a record year for Saw-whet Owls too! are you getting bored of weekly Cackling Goose sightings and pictures? The Cackling Goose streak continues! Were you ever worried? Multiple birds today, but this little honker stole the show. TINY bird, but I'm not 100% positive what subspecies of Canada are in the background of the 2nd photo - they could be maxima-like birds, which is why it looks SO small. 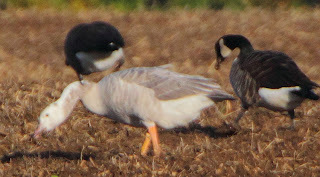 --- even still, it is a smaller than average Richardson's Cackling Goose. Other birds on the day were 100+ Pine Siskins, an overdue Snow Goose, lots of passerine migrants, and some lingering shorebirds. Add in the Eurasian Wigeon from yesterday, and it was a pretty solid 24 hours! I can't think of much else right now. Going to Moosonee/Moose Factory next week. That will bring some birds - with my lovely lady friend Jenn! Well it's pretty clear that something happened with the weather/birds. I'm still betting it was the stalled low pressure system over the NE days ago - and birds are still being found from it. One of the first in Ontario (Golden-crowned Sparrow) is still around, so other recent rarities could have been present all along too! $*&#*! White Wagtail? Note they had several other rarities in a similar area to the Ontario-rares!!! This past weekend was the first weekend in a while that I didn't get birding. The good news, I bird when I work too! So there have still been some sightings. Apparently I've been on the very "edge" of the rarity-blanket, turning up a Brewer's Blackbird late last week (female) and a male Eurasian Wigeon today. Not bad! (but not a Vermily-fly or White-wag). 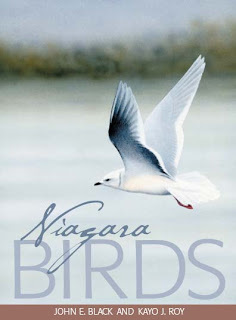 Saturday was spent at the very exciting book launch: Birds of Niagara by Kayo Roy and John Black. 5.5 years of their work turned up this stunner of a book. Good thing about being a photographer: Donate some photos and you get a free copy - and this one is worth it! I've got 92 photos in the book, which is all printed in colour and high-quality paper. Christmas present anyone? After a painfully slow day of birding, I couldn't help but think about those photos of an adult male Vermilion Fly that showed up in my email inbox this morning. Painful!!! So with McCown's Longspur, Laughing Gull, Golden-crowned Sparrow and Vermilion Flycatcher all seen in a similar time frame, in a similar area (far eastern Ontario, sort of). What happened? Was it the stationary low pressure system that sat just outside of Ontario for several days last week? I'm guessing it might be - the birds were blown in, but it's taking a few days to find them. The GCSP has been around for 4-5 days now! On that note, I need a break! I can't help but notice there is currently more Low Pressure centred over eastern Ontario. More birds on the way? 3rd week in a row with Cackling.. How long can it continue? Had multiple birds today, but nothing else. In serious need of some "white ones" to keep things interesting. My goose article is offline, but has the typical adult Cackling look (Richardson's). Seen here with a Todd's Canada (middle) and an unknown (Giant or big Todd's) on the right. Nice bird. Had a better looking adult earlier today, but no photos. After missing out on the Yellow-nosed Albatross and Black-bellied Whistling Duck this year, there's a report of Vermilion Flycatcher on ebird right now...... Would make me very sad if confirmed. Lincoln's Sparrow, New for Europe a day or two ago! 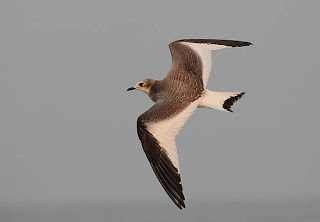 In the pre-blogger blog, I mentioned a bit about how the current La nina episode could mean more storms and more storm-waterbirds this fall/winter. The pattern slightly mirrors recent records of Thick-billed Murre and Northern Fulmar records in Southern Ontario. (66.6% of records in 20% of the years that had La nina conditions). Sea ice is melting more every year, allowing waterbirds to fly further north. The further north they get, the easier it is to "switch" continents or oceans when they begin to fly south. A few hundred km's in the far north could be 1000's at lower latitudes. Possibly why Newfoundland has had it's first 12 SBGU records from 2006-2009. 2009 brought Tufted Puffins to Greenland and the UK!!! So what does this have to do with Ontario? Well we have very large bodies of water on our north coast - James and Hudson Bay. If only someone went up there to find these birds! With 10 the least, and 1 being the most likley! ..PS there's a Golden-crowned Sparrow in Ottawa. Floated Jenn out into the boat early on Sunday morning. Short on time (Turkey dinner in the evening), we launched from Van Wagner's. We threw bread for a few hours, but didn't have too much (Bonaparte's, C Loons, 1 Juv. Lesser Black-backed Gull and a Parasitic Jaeger that didn't come in). Jenn headed for a 3 hour work session around 11am. I went back out, and eventually continued the bread-toss. More distant Parasitic Jaegers, a Red-throated Loon, Another Lesser Black-back and more common birds until a small Jaeger did a quick fly-past . I think I wanted Pomarine Jaeger, so I continued to throw bread - even when the weather was clearly telling me to look for Red Pharlies and Pacific Loons. Next time I get out, more will happen! -- Should also mention the huge flocks of White-winged Scoters (and lesser #'s of Long-tailed Ducks, Surf Scoters) - WAY out on the lake. Looking forward to future chances to scan them! After the weather became un-blocked a few days ago - I had the chance to do a great day of hawkwatching on the strong NW winds. The numbers came through, and I had a few goodies. Most notably, 3 Goshawks! (Also a late Philly vireo and lots of finches). But let's look at the Goshawks! First Gos of the day - a juv male. Male Goshawks often give the impression of a huge Sharp-shinned Hawk. Young birds lack the gray tones of adults (and lack the pink tones of adult Cooper's, obviously). The next gos on the day, was a young female. She flew over really high, so the picture's are pretty bad, but here's one below. Female Gos' give an impression much more like a Red-shouldered Hawk (in their huge size, but also structure), compared to the "Giant Sharpie" look of the male. - Compare the massive size with the sharp-shin in the bottom right. 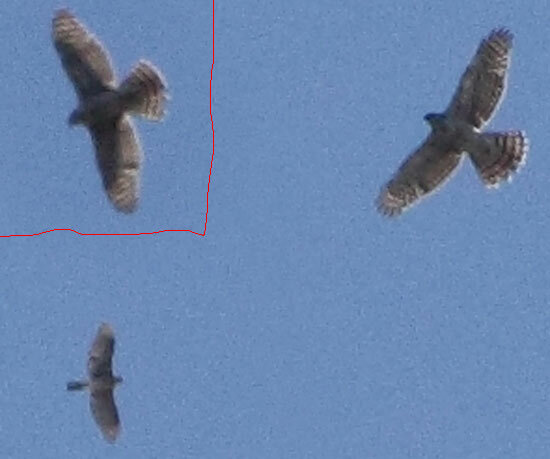 Another photo (added in the top left) - show's how Buteo-like they can look when soaring. Difficult to see the streaking in this poor photo. Final gos of the day was a 2 year old male, that came over lower. - "Giant Sharpie" structure really obvious in this photo. A strong "shoulders" like a Sharpie (not the t shape of a coop). 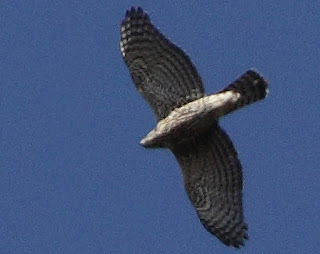 Also obviously a Goshawk when they get their striking gray pattern on the belly. Aged as a 2 year old bird, by the mix of adult-like and juvenile flight feathers. 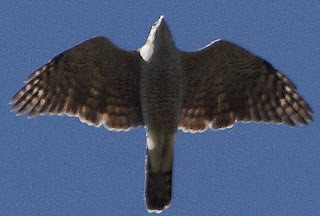 The longer brown feathers are the retained Juv. feathers, giving the bird an un-even, jagged edge to the wing. This works on a lot of raptors! (Often most obvious on eagles). What da heck is this?! A bit short on time, more soon! Anyone not notice the Sulphur-bellied Flycatcher banded at Thunder Cape? - Sharpie lands 30 ft away for superb views. - large raptor crashes through the woods, flushing the raptors and all songbirds again. - large raptor lands 50ft away in good light - it's a Juv. Male Northern Goshawk! - 1 minute plus of great Goshawk views, sitting on low branch. - Goshawk takes fligth, Sharp-shin returns and chases Goshawk. ----- All happened in a 5 minute span.. No camera, but a great birding experience. Website is no longer listed as dangerous by google, but it's also lacking all content. Not sure if that's an improvement or not? Is it good? Bad? I think it might be good. These pages are designed to help with these difficult to ID birds..... Always looking for feedback! Send me an e-mail and let me know what you think. You could also leave a comment at the bottom! Never fear, you can leave comments as "anonymous" as well! Any comments are appreciated. Last year I had a streak going. Sept 15 to early December, at least one Cackling Goose per week - often more! Click for large-size. Middle bird. Note how most CACG (adults only) are paler than the Canada Geese they hang around with. 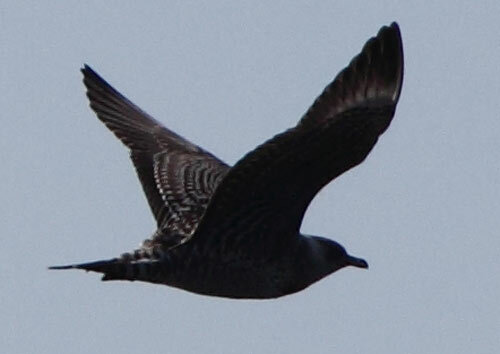 This is a large-end CACG, but still has the good bill-shape and long flight feathers. It's also hanging around with Todd's Canada Geese, which is why they look so small! Shazzam... What the heck is that? Well it's an adult Todd's Canada Goose wearing Richardson's Cackling Goose clothes. Very pale body colour with bold feather edges. A good learning bird. 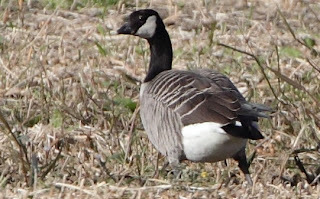 I probably find 25 to 50 Cackling Geese before I find a Canada that looks like this. Pale body colour - excellent way to find Richardson's Cackler's in Ontario (adults).. Does it work 100% of the time? No... But it's pretty good place to start. good day today, in the ever-spinning low pressure system. TONS of sparrows everywhere, pipits, my first Longspurs of the fall, Common AND Caspian Terns (yes, they're still here).. Osprey.. Great day to be birding. After spending years at the old lakewatch, I can finally get my name next to an Arctic Tern. A striking Juv! 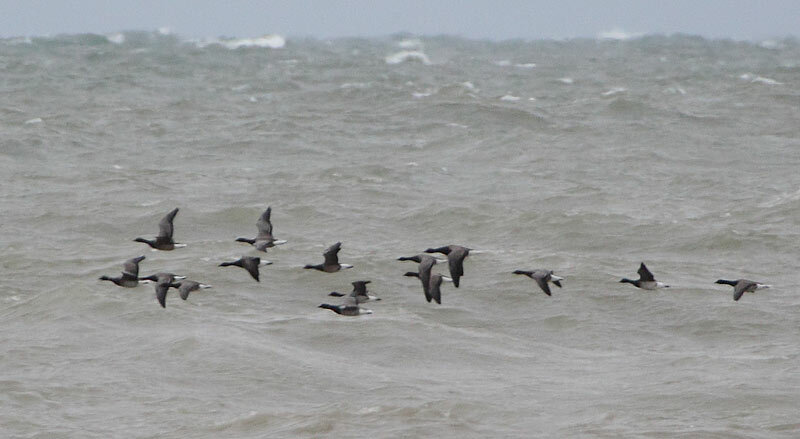 Stu Mackenzie spotted the small sterna heading our way, and it thankfully came within 20/30ft of shore! Pausing to pick at the surface a few times before heading south. 1-2 Pomarine Jaegers (1 bird I called a light adult (distant), one juv). 6+ Parasitic Jaegers (hard to say how many, but at least 6),,, more adults than juv's. Lesser Black-backed Gull - 2 - juv's.. One hung around close to shore for a while. 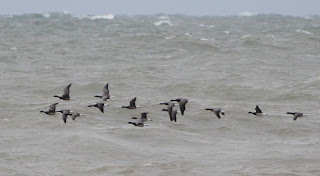 ---- also a heavy waterbird movement in the morning.. both Loons, WW and surf scoters, most puddle ducks, most diving ducks, mergs, a few Bonaparte's gulls, etc etc..
Strong NE winds in the forecast for most of next week. If anything unusual DID get blown onto lake Ontario from last weeks storms, the Hamilton lakewatch will be the place to find it. The Ontario Odes group got an exciting email from Bob Curry a few days ago, who found Canada's first Striped Saddlebags at Point Pelee! (Dragonfly). Awesome find! It's late in the ode-season, but feel free to join the ont-odes google group. The best way to learn your dragonflies! They're like a whole new family of birds. Still working on getting my website running again. What a pain!!! More jaeger photos etc. once it's back online. My sunday plans are lakewatching. Going to see what else has stopped by Lake ON for a visit! 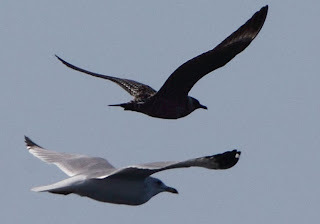 Frigatebird odds for Lake Ontario just went from 0.2% to 2.8% !!! Yesterday (Sept 30) was just one of those days. In the afternoon, I got my beautiful girl out in the boat. From 4:30ish to 6:30ish.. A rather short-lived trip but the results were over the top. First up was 6 Red-necked Phalaropes just offshore (inside the wave tower). The water was coated in tiny flies, which made the pharlies happy. Unfortunately we were throwing bread, which had the Ring-bills around, and they chased them frequently before we were able to get too close for views. --- After confirming the ID (was hoping for Reds) were were getting ready to bread-toss again when a juv. female Peregrine Falcon came cruising across the lake. She lined up the poor little pharlies on the water, and gave the flock heck for 30 seconds. She eventually picked one individual out, and chased it upwards to a great height (200+ ft?) before we lost track of them. Was pretty exciting! - Bread tossing then resumed, as we traveled out into the lake. 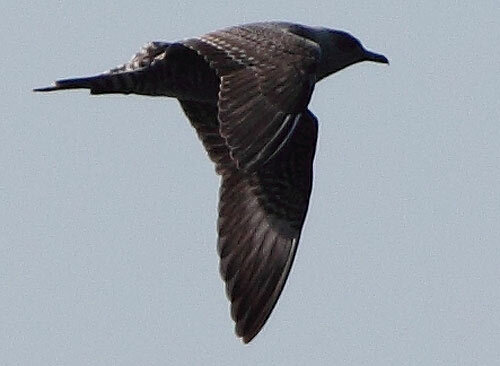 First up was juv. Parasitic Jaeger which chased our entire feeding frenzy away. 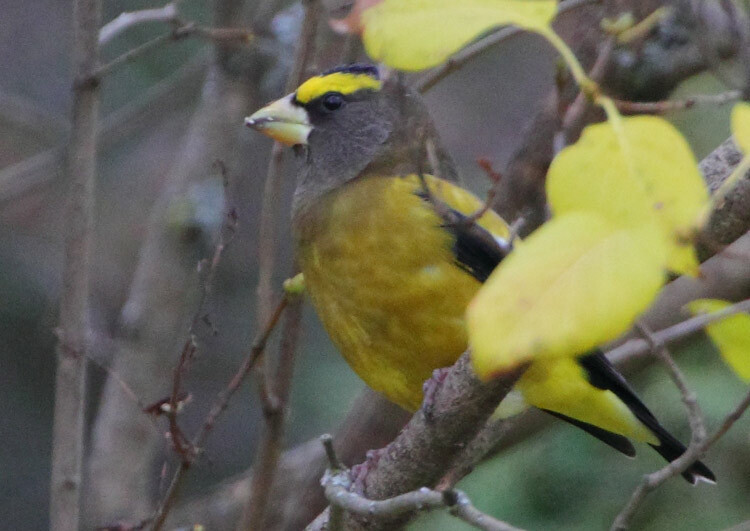 Photos were difficult, and the bird stuck to the distant edges of the group. After 5 minutes of distant passes, it finally headed for the horizon - just as a second juv. Parasitic Jaeger made a fly-by behind us. After the 2-Parasitic chase, we were left with a small and nervous bunch of gulls. Numbers eventually built back up in time for our 3rd Paraisitc (light adult) to chase them all away again. It was joined by a juv. Parasitic within a few minutes, but again they didn't really come close enough for any really good photos. Not bad for a short visit! --- The final highlight came in the form of a striking juv. Sabine's Gull which spent a good deal of time in the area, and eventually came right into the boat and ate some bread. This incredible gull was nice enough to pose for some photos, and gave Jenn some over-the-top views for her first SAGU experience.